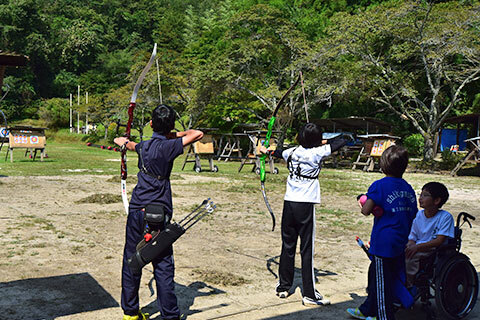 The only public archery range in the Chugoku and Shikoku area. Archery, for us, is an outdoor sport for anybody to enjoy. 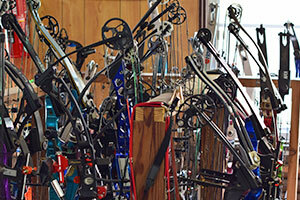 If you’ve ever thought about getting into archery this might be a good place for you to begin. We welcome everybody from the complete novice to the pro archer. 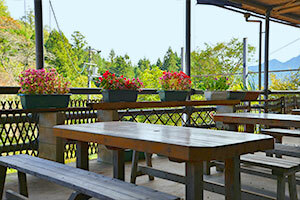 And you can have a wonderful outdoor barbecue at the end of your day too! 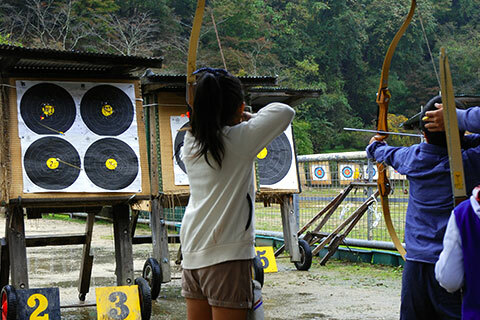 The Saiki archery range was established in 1972, the year of the Munich Olympics. And today, in Japan, it has quite a history, which explains why so many people come to visit – even if only for sightseeing. 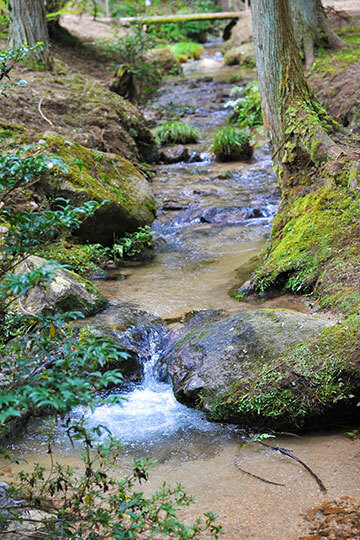 For the foreign visitor to Japan there couldn’t be a better place for connecting with the traditional Japanese use of the bow as a mental recreation instrument, along the Zen spiritual guidelines and the commitment to culture history. You can practically feel it getting into you. A visit to the range is a must, if you seriously want to remember your time in Japan. And we have more than experienced staff to see to it that all begins well and ends well for you. Oh and some of our instructors took part in the 2012 London Olympic Games. Well after all we have been literally raising young archers with ambitions to be the best in the country… and to represent Japan in international competitions. So visiting us will be quite an eye opening experience for you. And to please the visiting pro archer we allow for a handicap system. This gives them quite a bit of pride in demonstrating their skills. If instructions in English are necessary we can provide them though a reservation may be necessary. There are two ranges open to the public, one of which runs through a natural field setting. You select the one you want. And the fees will cover instructions and equipment you will use. Beginners can also try the natural range but of course after undergoing lessons with the instructors on the target training range. And it will take about two hours from training through to the open natural range for one round. You can try the Olympic Games archery events. You aim at targets along a plain flat ground. Small children and the physically challenged – in wheel chairs, can also take part in this. 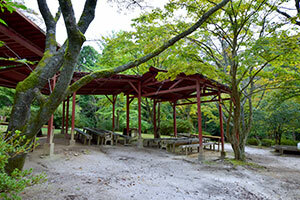 This is the only field archery range in the Chugoku and Shikoku area. You will then go around the natural range of about one kilometer in length. Visiting the archery field alone is no problem, however, people who come alone repeatedly tell us that the more you are the better it is. They say coming with friends is the better way to do it for memorable fun. 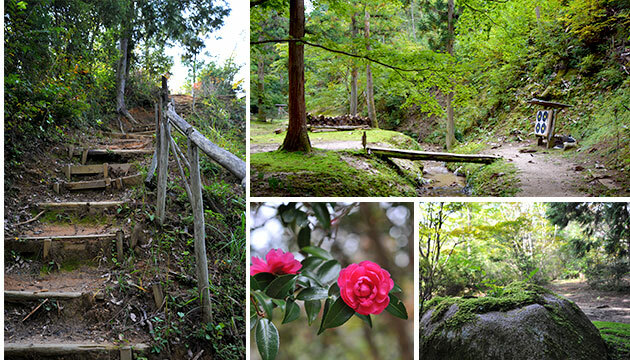 You could not find a better place in Japan to enjoy archery and short distance trekking while listening to the twitting of the birds and the murmuring of a small mountain stream running towards the sea. You’ve got to try this! For beginners, on the field range, instructors will help you select suitable rental bows and arrows, so you can enjoy the sport without too much worry. The archery here experience lasts one hour. At this range even for those who consider themselves to be not so good at sports and not so strong in energy, easily hitting the target in the bullseye should be no surprise to you. Out here you can earnestly enjoy a lifetime-like sporting archery and under safe conditions too. It’s a great and memorable fun. Though a little unusual this combination of field archery and barbecue allows for an even greater day to remember. 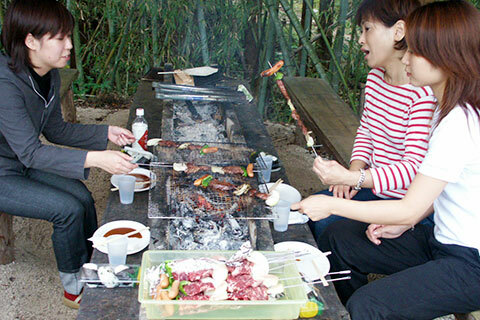 The BBQ* items are more Japanese style than western – ‘rice in bowls’, beef, chicken, vegetables and rainbow trout for instance, but good none-the-less. Group discounts are also available for organizational travelers such as schools, children’s recreational meetings, corporate groups, etc. As we all know, walking through nature calms you down. The natural sounds, colors, scents and aromas make you feel revived and feel clearer in your minds. And all our archery visitors say that while enjoying the archery they suddenly find themselves paying attention to the bird calls, sounds of the wind, and the colors and scents coming out of the plants around them as they make their way through the range. Many, who are urbanites, say archery suddenly gets the feel of nature into them. This surely releases them from daily stress and raises their attitudes in daily life and professions. 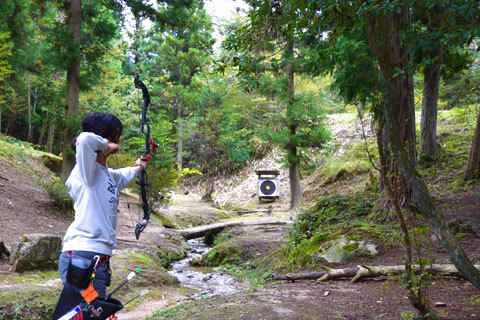 Come to think of it that is what archery was used for during peace times in ancient Japan. Break time meals are available on the terrace. Noodles, Curry and Rice, ‘Rice in Bowls,’ are a common mid-day meal in Japan, so they are here too. various kinds of archery equipment, for the beginner to the professional, in Domestic and International Brands (e.g. compound bow and recurved bow) are on sale. Very experienced staff members help in choosing the right equipment to suit the individual customer’s physical needs. Having equipment of your own will make you progress much quicker in archery than without your own so we do recommend a visit to the store. Professional ‘after sales service’ is also provided. We have a BBQ site, with facilities, along the field range. But due to regulations the carrying of BBQ ingredients or tools to the site is not permitted. And reservations for the BBQ are required. Our staff members help in setting the charcoal alight. BBQ in the forest is particularly good with the flowing stream and birds twitting around you. Get off the Sanyo Express Way at the Hatsukaichi Inter-change. Then go towards the Miyauchi Intersection along Route 2. It will take you about 20 minutes along Prefecture Road 30 before you arrive. A visit is most welcome. © 2000 - 2019 SAIKI INTERNATIONAL ARCHERY LAND.